Christopher Columbus was the first European to send enslaved people from the Americas to Europe, as well as the first to promote the enslavement of Africans in the Americas. And yet we still honor him with a national holiday? Please donate now to help Rethinking Schools teach a new generation of students the truth about Columbus and the people who were here first. Almost 25 years ago, Rethinking Schools published our first booklet, Rethinking Columbus. We believed there were teachers besides us who would be eager for an alternative to the rah-rah Columbus-discovered-America textbook fare. We had no idea just how eager teachers were: Rethinking Columbus sold a thousand copies a day, seven days a week, for the first three months the booklet was in print. And, thanks to Native American organizations, teacher unions, social justice education groups, and progressive teacher education programs, Rethinking Columbus has gone on to become a resource in classrooms throughout the country. Once again this year many schools will pause to commemorate Christopher Columbus. Given everything we know about who Columbus was and what he launched in the Americas, this needs to stop. If Indigenous peoples’ lives mattered in our society, and if Black people’s lives mattered in our society, it would be inconceivable that we would honor the father of the slave trade with a national holiday. The fact that we have this holiday legitimates a curriculum that is contemptuous of the lives of peoples of color. 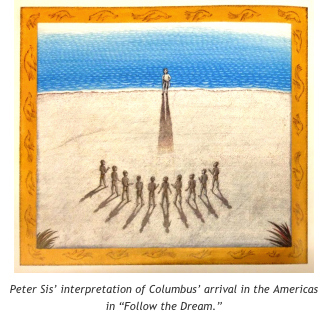 Elementary school libraries still feature books like Follow the Dream: The Story of Christopher Columbus, by Peter Sis, which praise Columbus and say nothing of the lives destroyed by Spanish colonialism in the Americas. No doubt, the movement launched 25 years ago in the buildup to the Columbus Quincentenary has made huge strides in introducing a more truthful and critical history about the arrival of Europeans in the Americas. Teachers throughout the country put Columbus and the system of empire on trial, and write stories of the so-called discovery of America from the standpoint of the people who were here first. Too often, even in 2015, the Columbus story is still young children’s first curricular introduction to the meeting of different ethnicities, different cultures, different nationalities. In school-based literature on Columbus, they see him plant the flag, and name and claim “San Salvador” for an empire thousands of miles away; they’re taught that white people have the right to rule over peoples of color, that stronger nations can bully weaker nations, and that the only voices they need to listen to throughout history are those of powerful white guys like Columbus. Is this said explicitly? No, it doesn’t have to be. It’s the silences that speak. For example, here’s how Peter Sis describes the encounter in his widely used book: “On October 12, 1492, just after midday, Christopher Columbus landed on a beach of white coral, claimed the land for the King and Queen of Spain, knelt and gave thanks to God…” The Taínos on the beach who greet Columbus are nameless and voiceless. What else can children conclude but that their lives don’t matter? Enough already. Especially now, when the Black Lives Matter movement prompts us to look deeply into each nook and cranny of social life to ask whether our practices affirm the worth of every human being, it’s time to rethink Columbus, and to abandon the holiday that celebrates his crimes. 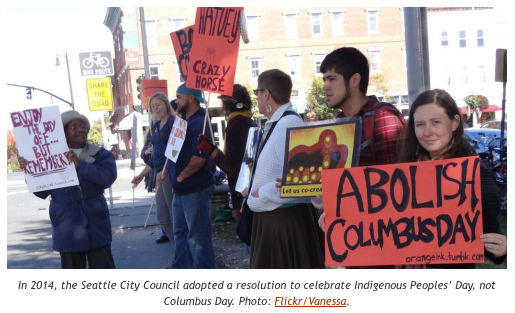 More cities—and school districts—ought to follow the example of Berkeley, Minneapolis, and Seattle, which have scrapped Columbus Day in favor of Indigenous Peoples Day—a day to commemorate the resistance and resilience of Indigenous peoples throughout the Americas, and not just in a long-ago past, but today. 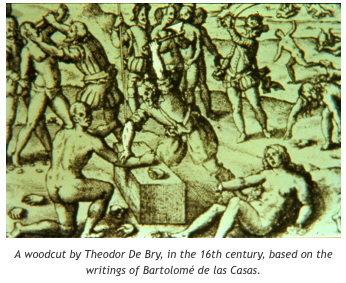 Or what about studying and honoring the people Columbus enslaved and terrorized: the Taínos. Columbus said that they were gentle, generous, and intelligent, but how many students today even know the name Taíno, let alone know anything of who they were and how they lived? We don’t have to wait for the federal government to transform Columbus Day into something more decent. Just as the climate justice movement is doing with fossil fuels, we can organize our communities and our schools to divest from Columbus. And that would be something to celebrate. Bill Bigelow was the co-editor of Rethinking Columbus. He is the curriculum editor of Rethinking Schools magazine and co-director of the Zinn Education Project. He co-edited A People’s Curriculum for the Earth: Teaching Climate Change and the Environmental Crisis. If We Knew Our History series. We like sharing interesting news, insightful opinions, activist victories, and actionable curriculum via Facebook, Twitter, and of course through our magazine and books. We thought why not collect some of our favorites ideas, opinions, and stories in one place each week. It gives you a peek at what piques our interest, and gives us the opportunity to revisit the news that’s shaping our profession and the public debate about education. Let us know what you think of this idea in the comments, and feel free to add to our list there as well. An Earth Day Message: Take Heart from the Abolition Movement, by Bill Bigelow. 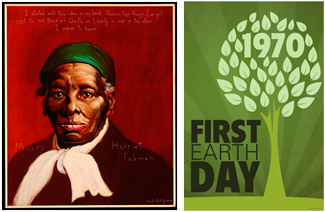 April 22 was Earth Day, and Rethinking Schools curriculum editor (and resident environmental justice expert), penned this column for our Zinn Education Project’s “If We Knew Our History” series. DeColores: The Raza Experience in Books for Children, maintained by Rethinking Schools contributor Beverly Slapin. A blog filled with astute reviews and essays. Teachers and parents — and anyone who reads — will find the blog to be a valuable resource. Protecting Classrooms from Corporate Takeover: What Families Can Learn from Teachers’ Unions, by Amy B. Dean, via Yes! Magazine. The Milwaukee Teachers’ Union, led by its president and one of the founding editors of Rethinking Schools Bob Peterson, is prominently featured in this well done article. Teachers Are Losing Their Jobs, But Teach for America’s Expanding: What’s Wrong With That?, by Alexandra Hootnick, via The Nation. The Nation has reliably good coverage on big education issues. Don’t miss the special focus on Teach for America in the spring issue of Rethinking Schools, too. Jim Crow in the Classroom: New Report Finds Segregation Lives on in U.S. Schools, via Democracy Now! This segment features an interview with journalist Nikole Hannah-Jones, whose multi-part investigation “Segregation Now: Investigating America’s Racial Divide” can be found at ProPublica. Americans Who Tell the Truth: Dave Zirin portrait, by Robert Shetterly. Our favorite sports journalist Dave Zirin was deservedly honored by Americans Who Tell the Truth with one of Robert Shetterly’s incredible portraits. Read about his accomplishments and view the portrait at this link. Pearson Pays $7.7 Million in Common Core Settlement, by Lindsey Layton via The Washington Post. The entire Common Core enterprise reeks of corruption. Here’s another piece of evidence. Scholastic and Big Coal Team Up to Bamboozle 4th Graders, by Joan Brunwasser, via OpEdNews.com. An interview with our curriculum editor Bill Bigelow about the successful campaign Rethinking Schools initiated to get Scholastic, Inc. to stop pushing pro-coal propaganda to 4th graders.